“Outside the Box” Brain Teaser Solving! Over the past few months, we’ve focused on logic puzzles quite a bit. Whether we’re figuring out Cheryl’s birthday, determining the weights of island castaways with a seesaw, or puzzling out which members of the starship Enterprise crew are fierce Fizzbin players, we’ve been fixating on deduction as a key puzzle-solving skill. But outside-the-box thinking can be just as valuable when it comes to puzzling, especially when brain teasers are involved. If there are ten birds on a telephone wire and you shoot one, how many left? At first glance, the answer is nine. But if you think beyond the mechanics of the question and into the real world consequences, you’ll realize the real answer is zero, because the other nine birds would take off when they heard the gunshot. Let’s apply this kind of thinking to a mathematical brain teaser that reportedly baffled 96% of America’s top math students. I can already sense eyes glazing over at the prospect of applying formulas and delving into high-end mathematics, but trust me: a little outside-the-box thinking will simplify this puzzle immensely. Now, remember that the string is wound symmetrically around the rod. That’s key to this. 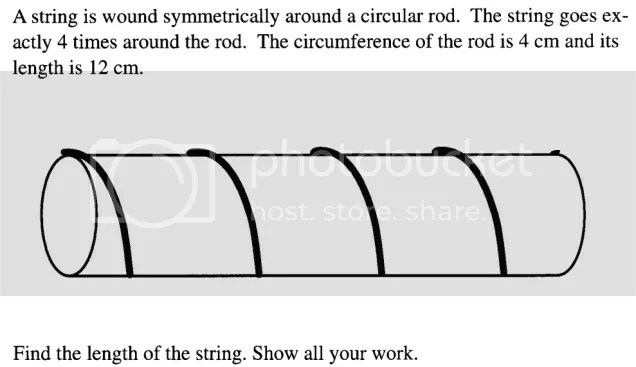 When you look at the rod, the distance from the string to the next loop of the string is the same. So each loop is 3 centimeters. How does this help us? Well, we know the circumference of the rod is 4 centimeters. Between these two pieces of information, we can ignore the rod entirely and mentally flatten it out into a rectangle. Now we’re not dealing with a rod and a string, we’re dealing with four diagonal lines. And with one of the best known mathematical principles — the Pythagorean theorem — we can determine the length of one of those lines. We’ll treat the diagonal as the longest side of a right triangle. The rod has a circumference of 4 centimeters, which means the triangle has a length of 4 centimeters. Each loop has a width of 3 centimeters, which means the triangle has a width of 3 centimeters. And the Pythagorean theorem — A squared + B squared = C squared, meaning 4 squared + 3 squared = our diagonal squared — gives us 16 + 9 = our diagonal squared. So 25 = our diagonal squared, which means 5 = our diagonal. And since that diagonal appears four times, since our string wraps around the rod four times, our total length of string is 20 centimeters. 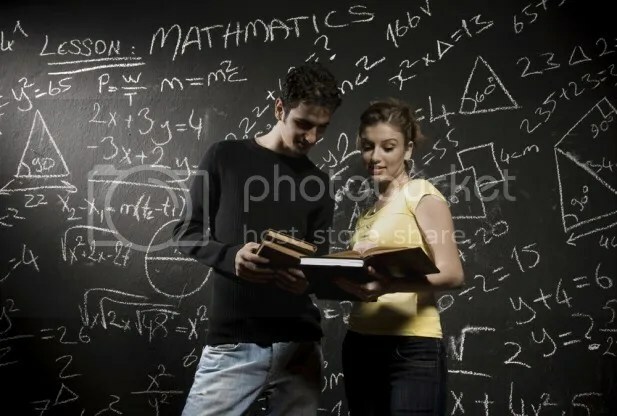 Okay, yes, that was a lot of math, but it would have been much MORE math had we not thought outside-the-box and tackled it from a different angle. 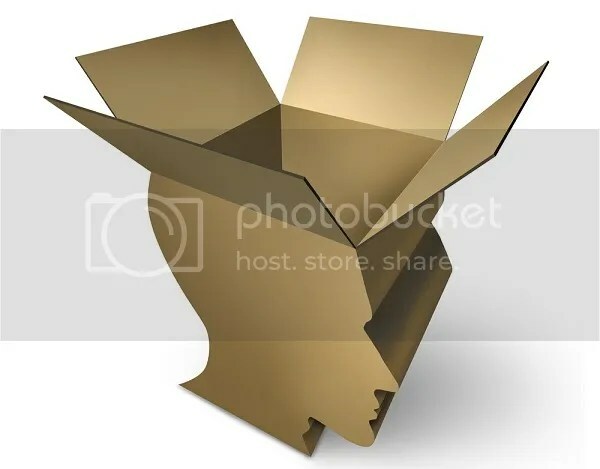 Now, I realize that I tend to pass myself off as a topnotch puzzler and brain-teaser specialist, but there have been plenty of times in the past when a brain teaser has bested me because I wasn’t thinking outside the box. Here’s one that stumped me recently. You have a set of 3 light switches. One of them controls a light in a room upstairs. You can turn the light switches on or off as many times as you like. You can go upstairs — one time only — to see the light. 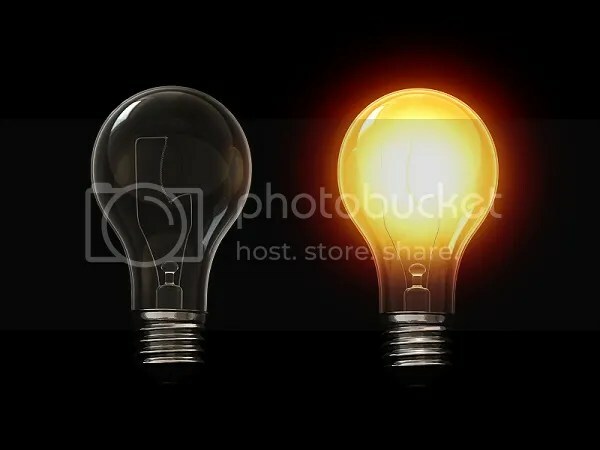 You cannot see the whether the light is on or off from downstairs, nor can you change the light switches while upstairs. No one else is in the room to help you. Based on the information above, how would you determine which of the three light switches controls the light inside the room? Let me give you a minute to think about this one. Now, the key here is maximizing the amount of information you can get from that single trip upstairs to observe the light. And it takes thinking outside-the-box to do that. Flip the first switch, and leave it on for a few minutes. Then shut it off, and flip the second switch. Leaving the second switch flipped, head upstairs. Now, visually, there are two possible outcomes: either the light is on or it’s off. 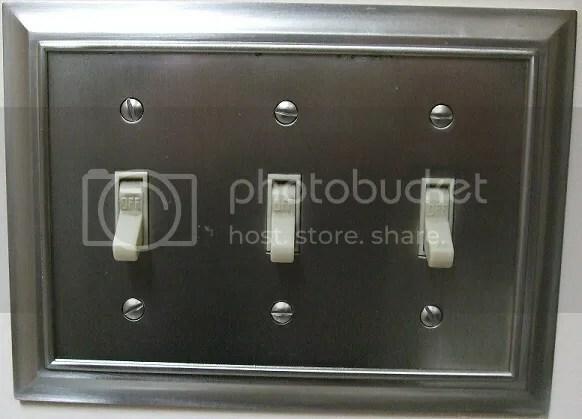 If the light is on, you know the second switch controls the light. If the light is off, however, there are still two possibilities. In this problem, it’s easy to fixate on information from your eyes, but the solve depends on another sense. Remember how we flipped the first switch and left it on for a while? Well, if the first switch controls the light, we’ll be able to feel residual warmth from the light being on if we touch the light. If the third switch controls the light, the light will still be cool. And there you go: one trip upstairs, one answer. So, now that we’ve handed deduction puzzles and outside-the-box stumpers, you should be ready to tackle any riddles and brain teasers you encounter!